Where will Washington find $4 trillion in cuts? President Obama about to begin his meeting with congressional leaders at the White House Thursday. 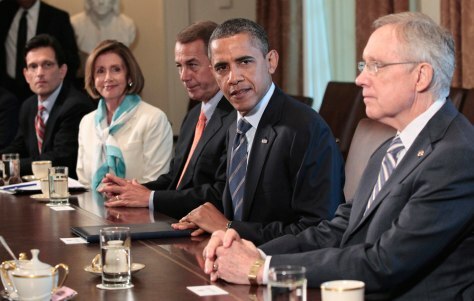 From left are, House Majority Leader Eric Cantor, Minority Leader Nancy Pelosi, House Speaker John Boehner, Obama, and Senate Majority Leader Harry Reid.